Now that the 2houses new version and its amazing new features are out, we will introduce some of the main new ones here to make sure this new version is no longer a secret for you. Today we’re going to introduce one of the features that many of you asked for, the display of report by period or by category! 2) If you chose a report by category, the system will generate a pie-chart report and will display the percentages by category. 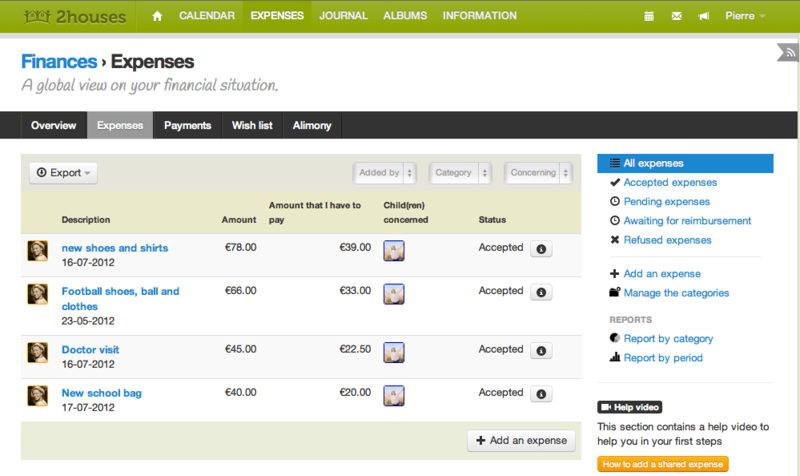 You’ll be able to filter your expenses by children, parents and by period in the menu at the top of the pie-chart. Under the pie-chart report, the system also generates a list of your expenses by category. You have the possibility to export your expenses in .pdf format or .csv format by clicking on “Export” at the top of the list, and choose one of these two formats. 3) On the right menu, you have the possibility to display a report by period. To do so, click on “report by period“. The system will generate a bar chart report with your expenses of the year with the amounts link to each category. You can filter them by children, parents and choose to take into consideration expenses not approved and pending or not by ticking or not the box in the filter menu. 4) Under the bar chart report, the system generates a list of your expenses by month. You have the possiblity to export your expenses in .pdf format or .csv format by clicking on “Export” at the top of the list, and choose one of these two formats. And that’s all! You can now display a report of your expenses and export them! Your financial management is easier than ever!